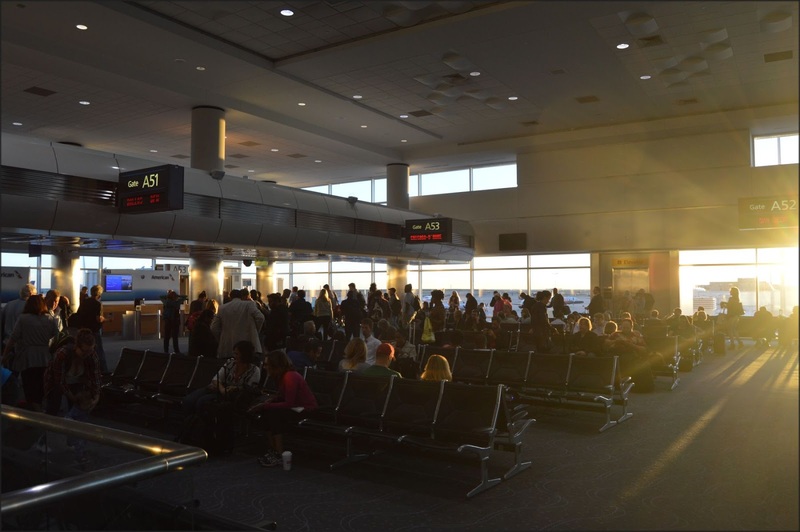 Frontier Airlines has one gate to one destination at IND, and this morning, it was packed. I completely forgot it was 5:30 in the morning; the lively group that surrounded me was talking excitedly, checking a few last things off on their phones, and gathering their stuff before boarding. Slowly, the blob of passengers self-corrected into a real line, and as I found my place in it, I looked around at my fellow budget-friendly flyers. When I booked my ticket on Frontier, I made an assumption about their target market and the travel preferences of that market. I figured someone like me was who they were aiming for; young, budget-conscious, willing to be severely inconvenienced to save a few bucks, no-frills. The paid services Frontier offered while I reserved my ticket would be hilariously lofty costs, just something to click “no, thank you” on while booking my thrifty ticket. But I was in the minority. People of all kinds surrounded me. Businessmen, families with lots of kids and expensive carry-ons, couples traveling together, as well as a handful of solo travelers like myself. It’s clear, though, that for most everyone getting on that plane, Denver was not going to be their final destination. Frontier was one part of their trip, and getting to Denver was just the first step. People had their $5 boarding passes printed off and clasped in one hand, and the vouchers for their paid-for carry-ons in the other. For these people, the low-cost-carrier model was not only attractive, they made it work for them. 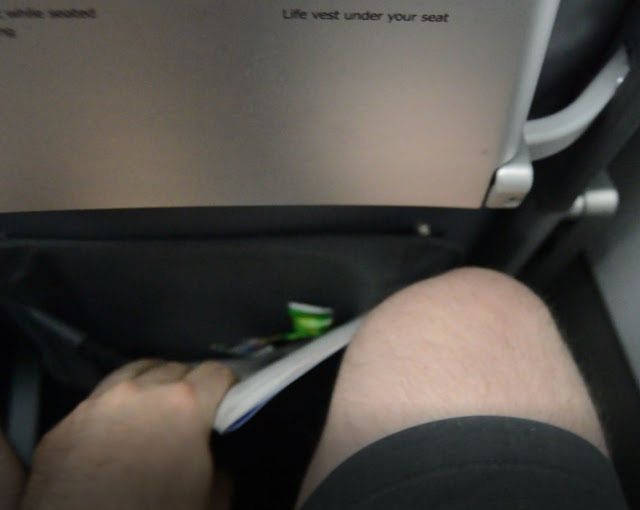 I was certain I’d be one of dozens of airline bums looking for a cheap leg, skimping on everything but the bare minimum, and I was flat wrong. People really had purchased their tickets à la carte, choosing what they wanted and forgoing what they didn’t. Many weren’t just willing to brave the airline for the low-cost, it fulfilled their specific, customized need. Maybe Frontier and other low-cost-carriers wouldn’t be all bad. Well, maybe we shouldn’t be so rosy. We’re not on the plane just yet. 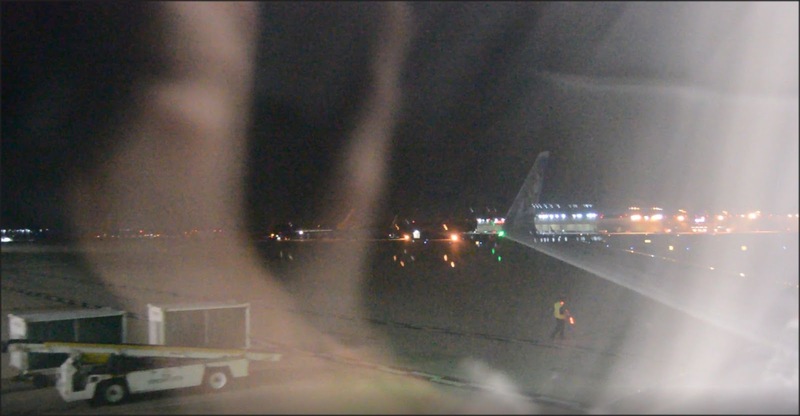 The plane’s takeoff time was set at 6:05 AM. Normally, boarding is supposed to commence 30 minutes before then, but I can’t remember the last time this actually happened. Usually, though, if it’s fifteen minutes before pushback and we’re not boarding, I get suspicious. Frontier decided to test my limits. Boarding began exactly fifteen minutes before departure, but despite the delay, it was neat and orderly. Well, mostly; one fellow at the beginning of the line wasn’t able to bring his clearly-oversized bag onto the plane and he threw a bit of a fit, but hey, that’s what you get when you think Frontier is like everyone else. That ticket’s cheap for a reason, hombre. At 5:54, I walked onto the jetway, and three minutes later, I was seated in 9F, forward of the engine on the starboard side of the plane. So one of the most quantifiable ways to determine the quality of your seat and the airline at large is the seat pitch, i.e. 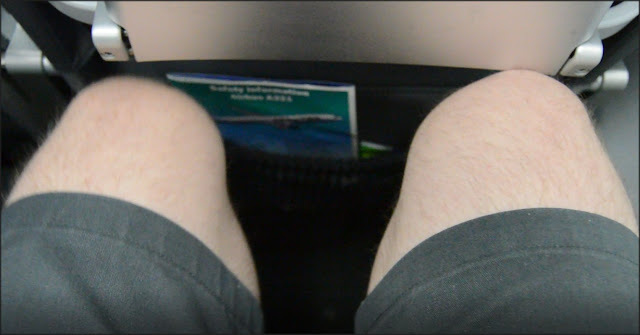 how much room is between the back of your seat and the same spot on the seatback in front of you. Mine was 32”, which these days, is on the high end of the economy size, with some airlines having as little as 28” from seat to seat. I may have been one of the lucky ones, as 28” and 29” seats comprised most of the seats on the flight. I’m 6’2”, so 32” actually gives me perhaps an inch of wiggle. Not bad for 61 big ones. Admittedly, this is probably a slightly inflated number. 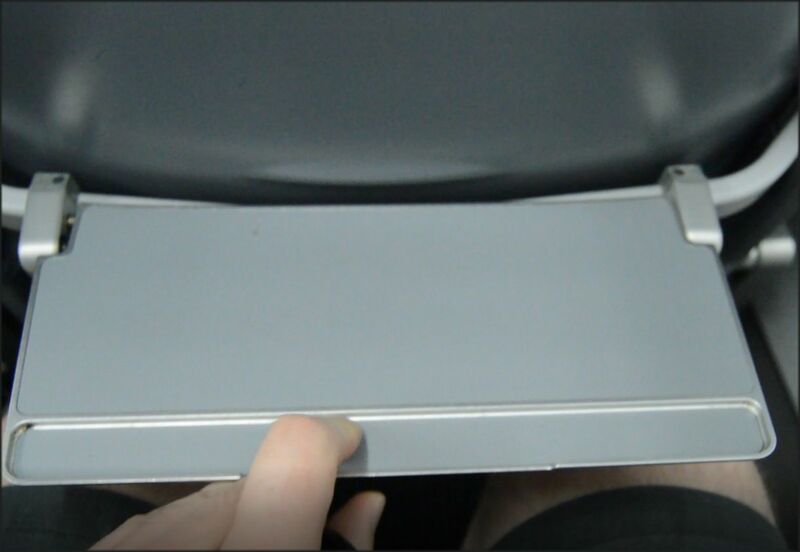 The seatbacks can be (and were) skinnier, and the pockets were emptier, which help effectively improve real legroom. They definitely leveraged the seatback pocket. Take a look inside. Ignoring my crunchy oat bar wrapper, the seatback had nothing in it except the government-mandated safety placard. No magazine, no SkyMall, no chilled Evian bottle. What a rip, right? That’s a shrimpy tray table, too, so named because it could hold exactly one shrimp. Which would probably cost you $14.00 plus tax on Frontier. But really, what’s it going to hold? No drink, no magazine. Big enough to basically write a check, which can be used for purchases onboard for a small service charge of $47.00. Nah, I’m just joking. But still. This was a short flight, mostly in the dark, so I wouldn’t need much to entertain myself. The Frontier cabin crew was all business, getting passangers in their seats and putting away their bags. They were pleasant, though not what I’d call “bubbly.” While on many airlines, both full-service and budget, I’ve seen flight attendants as companions to the flying experience. Here, the cabin crew was doing what they were hired to do: their job. That’s okay; again, it’s just a different experience. Much to my surprise, I felt the plane lurch back from the gate just three minutes behind schedule at 6:08. The safety demonstration commenced, which was delivered by-the-book with the exception of the name they gave their aircraft: Courtney the Cougar. Apparently, Frontier names each of their planes after a specific animal, a frontier animal, I suppose, and gives each a unique livery to represent them. After the cabin crew concluded the safety demo, the captain came over the PA with a brief announcement, indicating that the flight time was about two hours and twenty six minutes, which would put us in around sunrise, just like I’d planned. 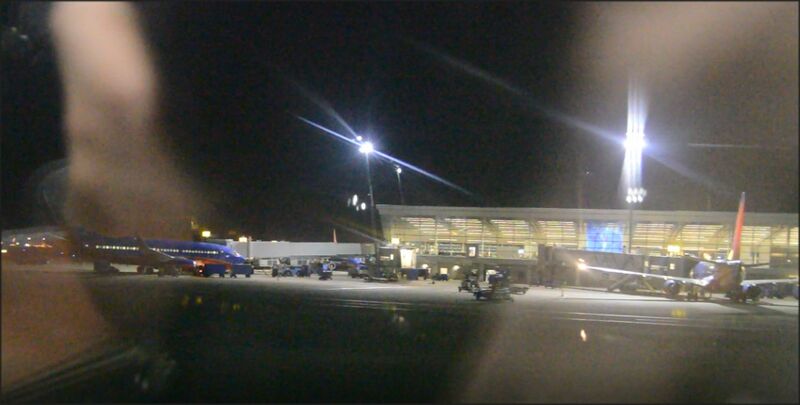 Southwest took up the areas of Concourse B that extended beyond the Frontier gate, but even they hadn’t really woken up yet. This was good, though; we taxied out to the runway all by ourselves, unencumbered by traffic or sunlight. We taxied north, aiming for 23R for our take-off run, eight minutes after pushback. Leaving early in the morning has its benefits. Love that engine roar on takeoff! The sound of the engine is considerably different depending on where you’re sitting. In this position, though, I can hear the full power of this CFM International 56. And look, there’s Courtney the Cougar, featured on the winglet! Normally, my seat’s either on the wing or behind it, and most often that means I’m aft of the engine, mostly because seats this far forward on mainline airlines are economy plus, business, or first class. On Frontier, there’s no such thing, so these normally unavailable locations are prime spots to watch the flight. Our climb was easy and smooth, and about twenty minutes later, we’d reached our cruising altitude somewhere over central Illinois. The sky was clear, and below us, a swath of black rolled by as we soared over the quiet, sparsely populated Midwest. I fidgeted in my seat a bit. My neighbors, a couple perhaps in their late 30’s, early 40’s, had drifted off to sleep against each other. I can attest that that seemed more comfortable than propping oneself against the seat. The seats had been the most intimate part of my Frontier experience so far. They are rigid, thin, and notably immobile, without any recline potential at all. They’re highly reminiscent of the free-standing seats we have on our public TARC buses in Louisville, bolted to the ground lest someone take them for their “luxurious” cushions. Even just thirty minutes in this seat and I can feel the hard plastic beneath my Holiday-Inn-Pillow for a cushion. To be honest, I’d taken for granted how reasonably a typical airline seat supported my tuchus, but now I was quite aware. 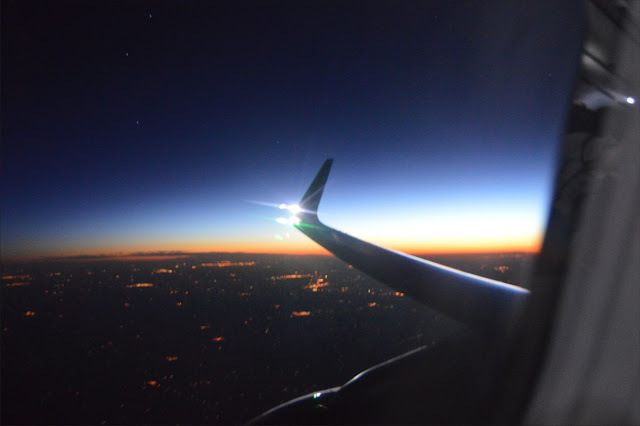 With the din of the airplane’s engine roaring beside me, the darkness outside, the lights low in the cabin, and without the possibility of video entertainment, a beverage service, or an airline crossword puzzle, there really wasn’t much to do. Sleep sounded more and more appealing, and my subconscious agreed. I clumsily supported my head on my hand, propped my elbow against the cabin wall, and closed my eyes. I didn’t really get to sleep. It was one of those kinds of half-naps where every few, immeasurable moments, you silently ask yourself “did I actually fall asleep for a second?” A chime, either real or imagined, stirred me from whichever I was doing at the moment. I felt a tiny bit more rested, so I must have gotten something. I was also a bit hungry. I reached into my stuffed camera bag, relieving it of another nutrition bar. I munched in the darkness, thinking about nothing in particular. Once I finished my bar, I looked over my right shoulder onto the wing. 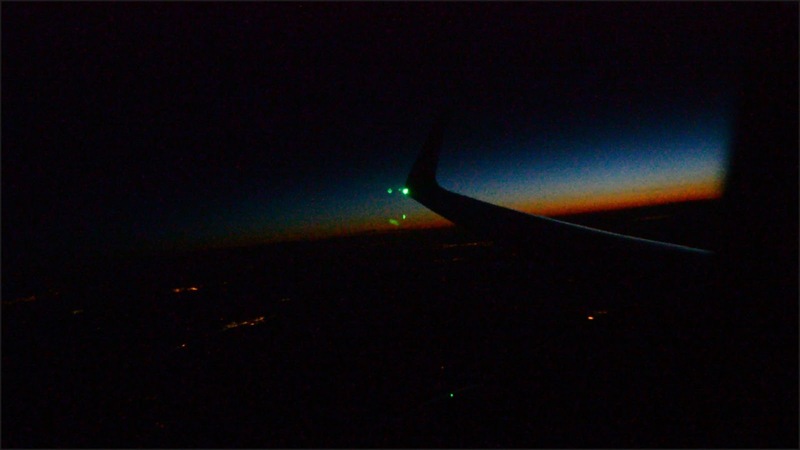 That faint glow in the distance would follow us abnormally long as we soared due west across the Great Plains. As such, it was hard to tell what time it was. My phone, which I’d already shifted back two hours to Mountain Time, indicated it was 5:25 AM. It must be 6:25 where we were, so the first moments of dawn made sense. We still wouldn’t be on the ground for at least an hour, though. After snapping some low-light photos, I decided to do the sleep/sort-of-sleep thing for a bit longer. The sun really was coming up now, and at just before 6 AM Denver time, that’d mean we would be on the ground in about half an hour. I looked around the twilight of the cabin. Most of the passengers were slouched over, trying to get a bit of sleep before what would likely be the continuation of a very long day. Some had their headphones on, their face buried in their glowing devices. Some were talking to each other quietly, much like you would to a neighbor on the bus. Which is fair, because that’s basically what this was. Not complaining, just observing. I looked outside again, this time down at the earth below us, which was steadily and methodically approaching. Moreover, I’m not sure we’d started our descent yet. If I can geek out for a second, I’ve flown from my hometown to Denver several times…on my flight simulator. I even did this exact flight I’m on from Indianapolis, in a Frontier A321 and everything, simulating the time, weather, and time of year before flying it in real life. One thing that’s amusing, and admittedly unique, about flying from here to Denver is the subtle, yet drastic elevation change. 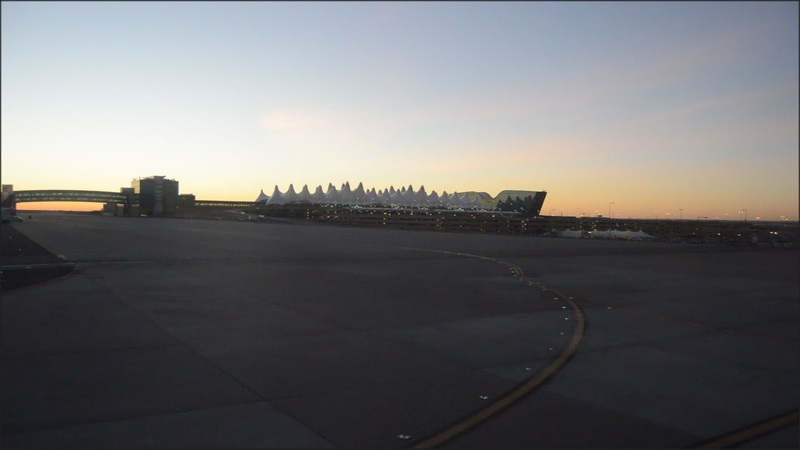 Denver is the Mile High City, and not just figuratively. One place we’ll be visiting on our walk is exactly one mile above sea level. Louisville and Indianapolis both are below a thousand feet, so when you fly to Denver, you effectively go up thirty-thousand feet and come down twenty-six thousand. As you make your descent, the Great Plains slope up with you, and before you know it, you’re at ground level. 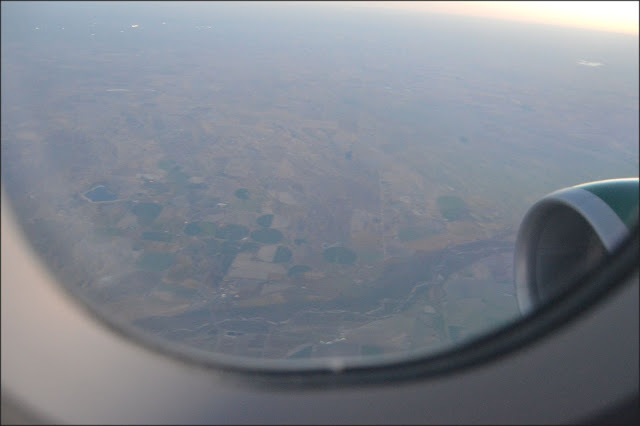 Unlike landing amongst mountains and huge topographical features, though, you’re landing in a “flatter” part of the world, so it can be quite disorienting as you check your altimeter and see that your current altitude of eight thousand feet doesn’t seem that high. 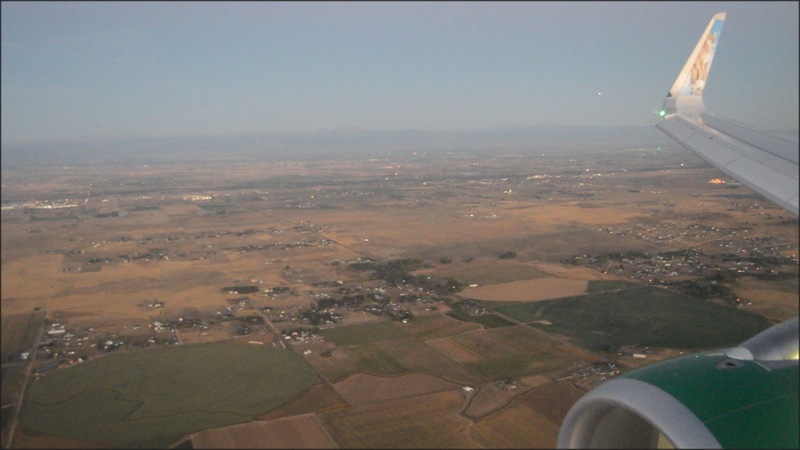 Denver is at the crossroads of two geographical regions: the High Plains and the Front Range of the Rocky Mountains. To one side, it’s farmlands for hundreds of miles. To the other, the broad range of the Rockies sprawls out into the distance. Based on our location and approach, we’re coming into Denver from the north, and perhaps on the western side of the airport. That means we won’t see the airport as we land, but it also means we could land on 16R, the longest commercial runway in North America; it’s over three miles long! Not sure this little Airbus needs that, but it’d be a fun bit of trivia. A smooth landing on neighboring 16R and we were on the ground and on our way to the gate. Denver’s airport is the largest commercial airport in the country by area, so even an on-time landing might mean several minutes in taxiing. As I snapped away with my DSLR in one hand and worked my GoPro with the other, my now-awake neighbors asked me about the two cameras pressed up against the plastic windows. I told them about my walking plans, much like I had with Truck Show a year and a half earlier on my way to MDW. Sadly, they were more interested in getting off the plane. Home for them was in Phoenix, one more connection away, and they had to buy this ticket in a hurry, from what I gathered. They’d had quite a poor experience with Frontier, though they didn’t expand on what exactly. I’m not sure if it was just the experience from when they boarded to now, or if it stretched back before that to problems with their ticket, their luggage, or making the reservation. Either way, they agreed they’d never fly Frontier again. I packed up my cameras as we hooked a left to get to our gate, A46. The chime dinged, we unbuckled, and we filed onto the jetway and into the terminal in groggy silence. Standing here at my destination, looking around at the familiar terminal signage and architecture of DEN, it became clear to me that Frontier had done its job for me. My experience with them so far had been brief, and I had only spoken with one of their employees to thank them for scanning my ticket, but that was all I needed. I walked over to the window besides gate A46, looking out at the plane that got us here, its livery more apparent in the dawn. Let’s face it; the experience of flying, even during my short life, used to be filled with luxury, vogue, character, and elegance. But we don’t live in that world anymore. Getting on a plane does not necessarily mean you’ll get the star treatment. In fact, it never means that. 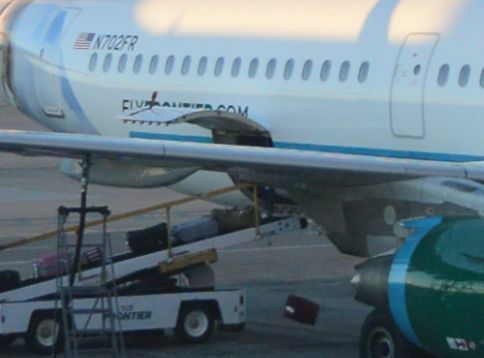 Frontier Airlines has made a name for itself on its current business model, and, given this single, narrow, one-time experience, it’s worked like a charm. I acknowledge the obvious limitations of the application of my experience broadly, and eighteen hours from now, we’ll see if the return flight is quite so seamless. But, from where I stand right now, this was a fine experience. If you don’t think of it as an airline as much as a bus service that looks a lot like an airline, you’ll do much better. If you’re able to change your mindset going in, you can check your expectations at the gate. Next week, we’ll walk through each of Denver’s three concourses, its main terminal, and take the train from the airport to downtown Denver, where our main walk can truly begin!